Mastodon State Historic Site is down in Imperial, Missouri about 10-15 minutes from the 55/270 interchange. The area was purchased in 1976 to set it aside as public land after archeological evidence of Mastodons and the Paleo Indians who hunted them was discovered. The Kimmswick Bone Bed is listed on the National Register of Historic Places, and there is a museum that has exhibits about what has been found and what life was like in our area long ago. There are 2 areas at Mastodon, both accessed from the West Outer Road along the highway. If you are coming from Imperial Main St., the first one you come to is the lower picnic section which is also the trail head for 2 of the 3 trails. You will go west from the W. Outer Road on Seckman Road, and about a half mile down on your left is the entrance. The 3rd trail is in the upper section, along with the museum, and these are accessed a little further down the W Outer Road, on Museum Drive. Last Friday, Max and I decided to hike the 2 in the lower area. 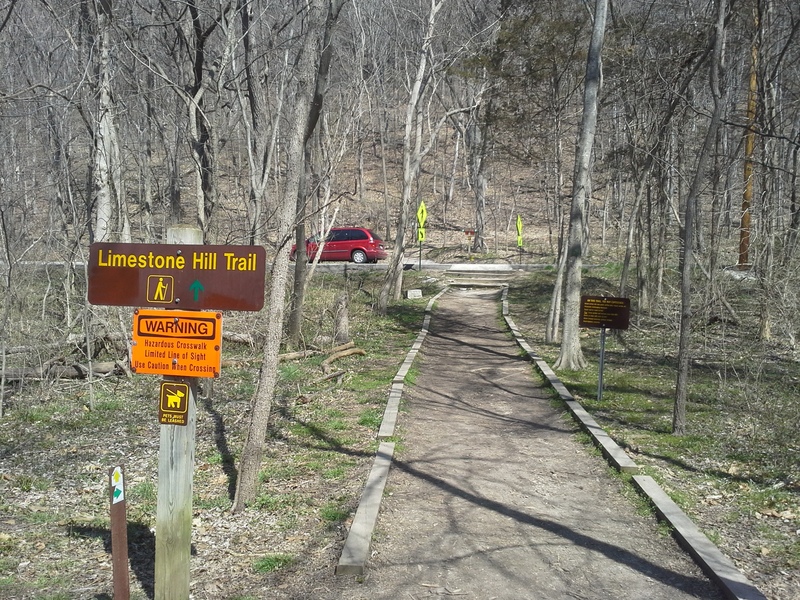 The longest trail at Mastodon is the Limestone Hill Trail at 1.75 miles. It starts out from the Spring Branch Trail, crosses Seckman Rd. and goes around the big hill in front of you. I usually take it in a clockwise direction. It goes along parallel with Seckman Rd. for a little bit through an old, predominantly cedar forest, eventually making a sharp right turn into some switchbacks as it climbs the hill. As you make your way up, the forest opens a bit and changes from cedars to mixed hardwoods. 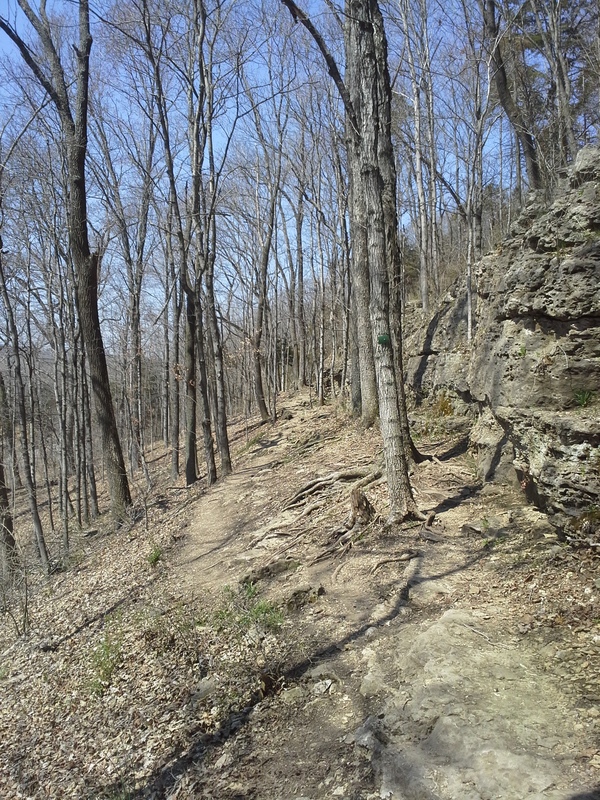 This section gets a little steep, but it is the most challenging part of the trail. 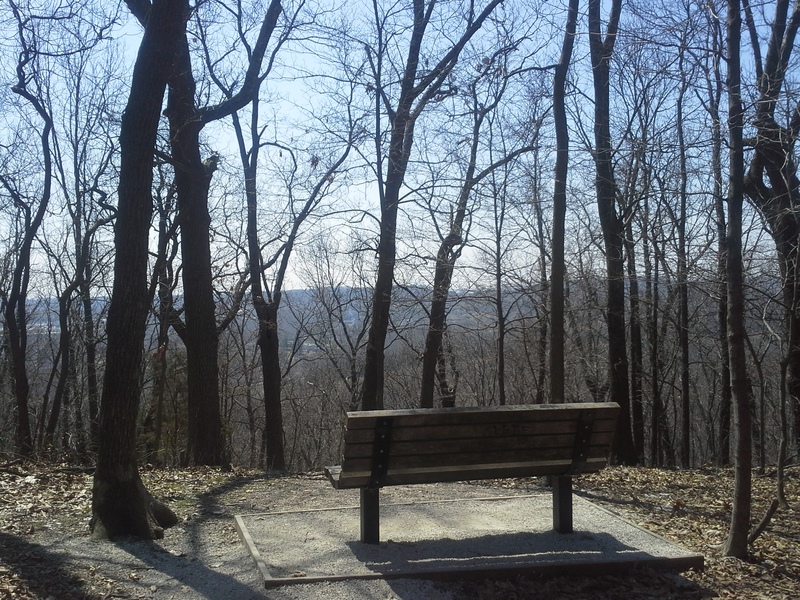 As you ascend to the top, there is an overlook area with a bench. Good place to take a break and get a drink after the climb. After this the trail makes it’s way over the upper area of the hill and shortly turns downward along the right side of the ridge. It comes through a cleared area with overhead power lines. Sort of a man made glade, and the difference in the underbrush as the year goes on is striking as the grasses and native plants grow toward the sun in the expanse. 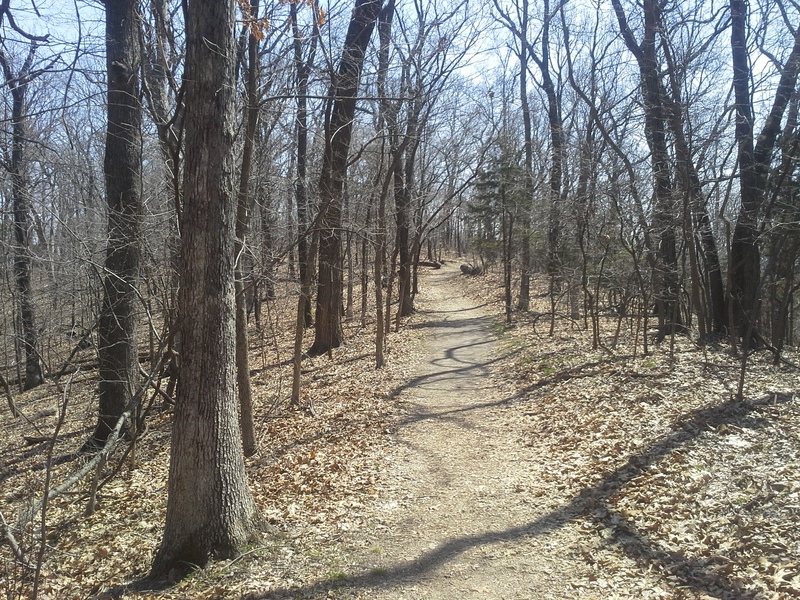 The trail heads back into forest and starts to work it’s way to the right and back to the slope above Seckman Road. This is where it gets abundantly rocky, and the last half mile moves horizontally across an incline with exposed limestone as a wall of rock on your right side for most of the way. Watch your step. The trail rejoins itself at the road crossing, and that is your 1.75 miles. The Spring Branch Trail is 8 tenths of a mile and deserves it’s own posting, so I will just say for now that it is worth it to walk this one too while you are there. It goes around through the Rock Creek bottom area, and is a nice level path. 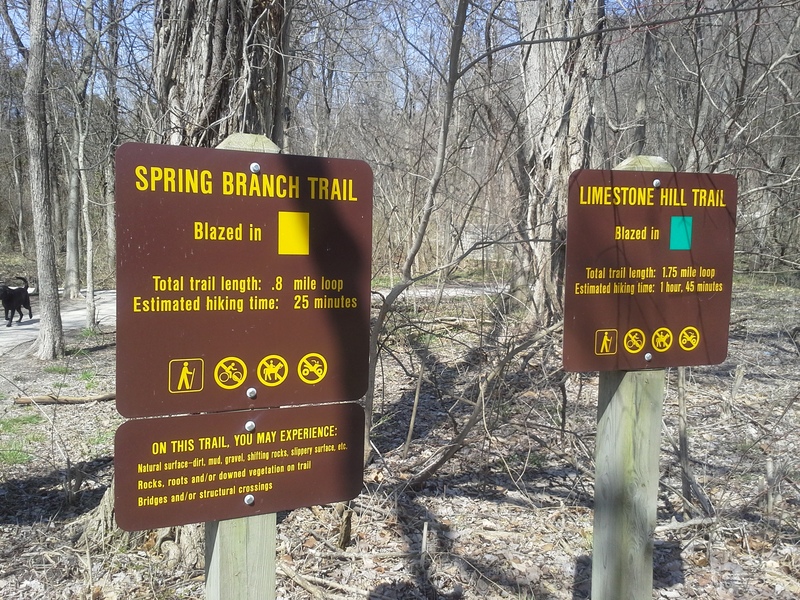 The Limestone Hill Trail is a good one if you want to get the heart pumping for a little bit because of the one hill, but also want to enjoy a leisurely walk through the woods most of the time. 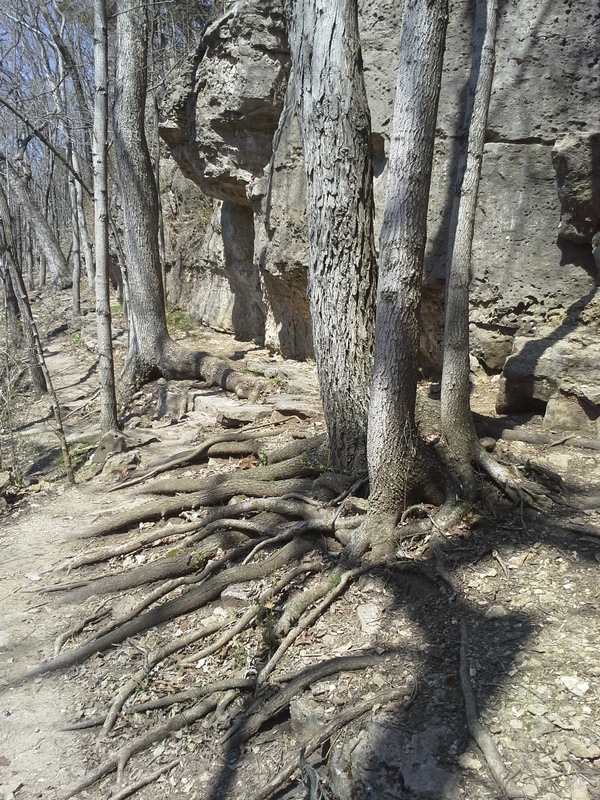 The exposed limestone on the part of the path along Seckman Road is fun to look at. Lots of little holes and openings on the face of it. Plus, I think the various trees clinging to the rock with their roots holding on tight is always a neat example of the strength of life’s determination. As one of the tallest hills in the area, the views to the southwest are nice from the top. Pack some food in a cooler to leave in the car. Hike it in the late morning an hour or two before lunch, and then use the picnic area in the lower section. Make a day of it! I would put this trail in the slightly moderate category. That one climb can be deceptively long. As the months get warmer, the traffic on this trail tends to increase (as with most trails). That, coupled with the proximity to Seckman Road and private property on the backside makes this a trail that you should definitely keep the dog leashed on. This is a popular picnic area on the weekends, so if you are looking for seclusion, this is not the place to go. Lots of people use this park, especially in the warmer months. Once you visit, you will see why! Good place to take the family. « Did you know that you can get FREE STUFF about Missouri outdoors and conservation?! ?